Don and Lynn are both active outdoor enthusiasts who met 24 years ago riding mountain bikes, something they still do to this day as active season pass holders at neighboring Mammoth Mountain. Naturally, their lifestyle and passion for June Lake extend into the winter months as each spends as much time on the slopes of June Mountain enjoying the deep powder and abundant sunshine for which the area is famous. They are active members of the local community who foster growth and progressive ideas, while at the same time maintaining an organic approach to keeping June Lake at its magical best. Lynn, who has three sons, spent many years working as a CPA on the “other” side of the mountains in Oakhurst, CA and obtained her real estate license over 14 years ago. She has been a broker now for six years. 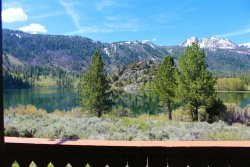 She started Sierra Crest Real Estate in 2008 and June Lake Accommodations in 2011, respectively, and is naturally the top selling and listing broker in the family. Don, like so many characters in our area, is a bit of a wildcard. Don’s taste for adventure as a semi-retired parachutist and BASE jumper landed him in June Lake with a fire and enthusiasm for life that infects all who have the pleasure of knowing him. Currently, he serves as a Commissioner on the Mono County Fisheries Commission, and previously he was Treasurer of the June Lake Chamber of Commerce. With over 42 years experience as a general contractor, his valuable knowledge of commercial and residential construction is part of the backbone of our property management services. Lydia March has quickly risen to become a vital part of our June Lake Accommodations team, handling our day to day operations as well as becoming quite the real estate agent herself. Mother to two young boys, Eli and Nico, Lydia and her husband Ryan are part of the growing community of young families that are coming to define this special June Lake area we call home. Lydia is a founding board member of the local non-profit Little Loopers which provides daycare along with other child services. She is also a board member of the June Lake Loop Women's Club, which provides scholarships to local students. Along with her involvement in the June Lake community, Lydia is passionate about snowboarding and hiking. On her days off you can catch exploring a trail or on the slopes at June Mountain.